Today was one of those hard, necessary days. All of the critters destined for freezer camp had to be taken to the butcher today. Getting the lambs was easy. Despite our horrible parasite loss this year, we still had five lambs to go down the road. The problem was that I wanted their fleece, but it’s been so rainy and I have no where to keep them dry, so I wasn’t sure what to do. Our shearer (Bruce Clements) suggested I bring them to him and he would shear in his barn, so that’s what we did. We loaded up the lambs last night, to give them a night to dry off, and then took them down this morning for shearing, on our way to the butcher. Poor lambs! It worked out well, though. We put them in the front compartment of the trailer, and left them there all night. There was a bit calling out for their mama, but not too bad. We got them all shorn in about 30 minutes. Bruce is good! Back into the trailer they went, looking pretty scranny, poor things. I’m not sure how much actual meat we are going to get out the this crew. We’ve got to find a way to fatten them up more than we have. The pigs were not that hard to get into the trailer either. Because they need to fast for 24 hours before slaughter, they were hungry beasts by the time it was time to load them up. Frank got out a bucket, and they followed along easy as can be. There was a bit of a scuffle at the actual trailer, but not too bad. I think it was 10 minutes for both sheep and lamb — not bad at all! I thought it would be hours, so whew! We took the trailer, all fully loaded, off to Troy. The butcher was the first stop — and we were pretty happy with their facilities. Each group had a pretty nice pen with water and ample bedding to calm down for a while. The actual killing is tomorrow, which I think is far better than doing it today, when the critter are all shook up from the move. We call Sunday night to talk about what cuts of meat we want, and we pick up the meat on Monday. We then took the two gilts off to East Hill Farm, also in Troy, where they will spend the next four to six weeks with their registered Tamworth boar, Harry. He seems a nice enough chap, though almost double the size our our girls! If all goes well, we’ll pick them up in a month, and have piglets in April. 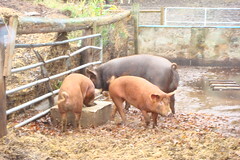 The cost for the date with the boar is one gilt from each litter, which seems more than fair to me. We really need to name our girls. With Harry being the father of the litter, I’m tempted to name one Hermione and maybe Ginny, from the Harry Potter books. I back up the trailer better than Frank, but man were my talents tested today! But hey, at least I didn’t jack knife the beast like I did the day we brought Polly home. Go me! 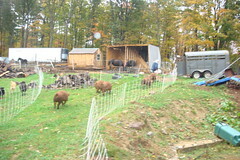 This entry was posted in butcher, Farm Life, Pigs, Sheep, Trailer. Bookmark the permalink. Post a comment or leave a trackback: Trackback URL. Ginny’s full name is Ginevra. I like the idea giving our sows nice florid names.